The 4th international GPLv3 conference is over … We are a bit relieved after days of preperations for the event. RMS started the morning session with philosophy behind main GPLv3 changes and after noon session was handled by Eben Moglen, he talked about the wordings of the change. I am trying to share some points which I could capture during the first day. Update: Transcript of the entire speech available here. The main changes to GPL from v2 to v3 is internationalisation and provisions to defend software freedom in the light of new dangers like DRM and software patents. The motivation for this change is to make GPL work in any country. To help in achiving this goal two new terms are introduced, viz propagate and convey (GPLv2 talked about distribution which has different meanings in different copyright law). convey – make copies available to others regardless of the way law defines it. Patent rertaliation clause can be added optionally. It us referred to circumventing GPL using DRM. This term was coined after tivo introduced DRM to restrict user modification of the embedded GNU/Linux system that comes with tivo. They have a hardware signature check and the modified versions won’t run. This law introduced in the US makes distributing of DRM circumventing software illegal. 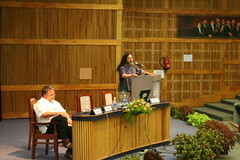 He also talked about the recent proposed changes to indian copyright law. Government advanced the date for accepting comments and rushing of such an important law is not justifiable. GPLv3 even allows to put DRM in your software, but the users should have the freedom to remove it. GPLv3 says you cannot use technical measures to do things which you cannot do legaly. They can take away the warranty for modified software but restricting users right to modify and keep the right with them is not allowed. You can give additional permissions on top of GPL and these permissions can be removed by derivative works (now LGPL is GPL plus additional permissions). Certain additional requirements, which does not affect the users freedom are allowed (like trademark protection caluse, patent retaliation clause). This increases the number of GPL compatible licenses (Apachev2 will be compatible with GPLv3). GPLv3 makes sharing GPLed software with bittorrent legal. In GPLv2 any violation automatically terminates the right to use the software and this makes it very hard for those who violate by mistake since any GNU/Linux operating system contains thousands of programs these days. This clause is removed in GPLv3 with provisions to bring knowingly erring floks to compliance. Debian is celebrating 13th anniversary today. There is a happy news that HP is offering support for Debian on Proliant and BladeSystem servers to make this birthday even sweeter. “I find it really pleasing that companies are doing support for Debian not because we’ve negotiated with them, but because customers are asking for it.” said Debian Project Leader Anthony Towns. This year’s Debian Developers Conference will be held during FOSS.IN as a “Debian MiniConf”. The mailing list announcement here. If you have a new idea let us know.